Interested in leading a Frosh Trip for the class of 2004? Whether you're already a leader, planning to complete your leader training this semester, or interested in working as a manager or support staff, join us for a meeting about Frosh Trip 2000. We will have applications, and detailed information about this fall's program. For more information go to the Frosh Trip Home Page. How Do I Sign up for an OA Trip? Sign-ups for trips are on the TripStore on the OA Website. Payment for trips is due in advance, and will be charged to your University account. If you have any questions, please call the OA Office. This newsletter is published twice each semester to provide information about Outdoor Action's upcoming trips and programs. The Outdoor Action Program (OA) is Princeton University's outdoor experiential education program administered by the Princeton-Blairstown Center. For more details on OA activities see the OA Web Site. Dillon Pool: Sunday, 4/2, 7:30 - 9 p.m.
Lake Carnegie: Tuesday, 4/4, 4:30 - 6:30 p.m.
Lake Carnegie: Thursday, 4/6, 4:30 - 6:30 p.m.
Dillon Pool: Sunday, 4/9, 7:30 - 9 p.m.
Local River: Tuesday, 4/11, 4:30 - 6:30 p.m.
Local River: Thursday, 4/13, 4:30 - 6:30 p.m.
Day Trip: Sunday, 4/16, 12:00 - 6:00 p.m. Session 1: Sunday, 4/2, 9 - 10:30 p.m. Session 2: Sunday, 4/9, 9 - 10:30 p.m. If you are interested in learning to rock climb, then this 2-week course will teach you all the essential techniques of climbing, including tying in, belaying and specific climbing techniques like weight shifting, stemming, and laybacks. The course will meet at the Climbing Wall in the Armory. Course fee: Students $65, faculty/staff $90. Monday, 4/3, 8 - 10 p.m.
Wednesday, 4/5, 8 - 10 p.m.
Monday, 4/10, 8 - 10 p.m.
Wednesday, 4/12, 8 - 10 p.m. Outdoor Day Trip: Sunday, 4/16, 9 - 5 p.m.
Once you have mastered climbing techniques, the next step is to learn the technical skills of setting up ropes and anchoring systems so you can climb outdoors. The course will focus on learning to set up safe systems for top rope climbing. Topics include identification and use of natural anchors, equalizing loads, equipment, site management, and safety. This course is a requirement for anyone interested in leading a rock climbing Frosh Trip. Classes will meet at the Climbing Wall at the Armory. Course fee: Students $65, Faculty/Staff $95, OA Leaders $35. Climbing Wall: Tuesday, 4/4, 4:30 - 6:30 p.m. Climbing Wall: Friday, 4/7, 3 - 6 p.m. Climbing Wall: Tuesday, 4/11, 4:30 - 6:30 p.m.
Ralph Stover State Park: Friday, 4/14, 12 - 6 p.m. Climbing Wall: Tuesday, 4/18, 4:30 - 6:30 p.m.
Ralph Stover State Park: Friday, 4/21, 12 - 6 p.m.
Trip 1: Saturday, 4/8, 9 a.m. - 5 p.m.
Trip 2: Saturday, 4/22, 9 a.m. - 5 p.m. The Climbing Wall is an indoor rock climbing practice facility located in the Armory next to Jadwin Gym. Climbers of all abilities are welcome. Experienced instructors are on hand to teach skills and assist in solving particular climbing routes. The Climbing Wall is open only to students, faculty, and staff of Princeton University. PUID required. Children of members of the University community may climb with a parent present. 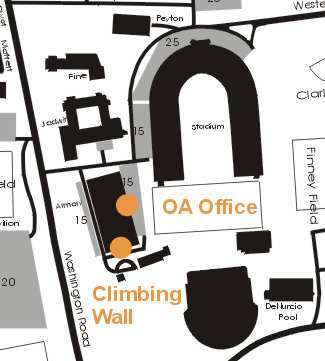 The Climbing Wall is open throughout the academic year except during breaks and final exams. Wednesday, & Friday, 4:30 6:30 p.m.
Monday, Wednesday & Friday, 4:30 - 6:30 p.m.
Tuesday & Thursday, 8:00 - 10:00 p.m. Passes can be purchased at the Climbing Wall. You must have your University ID. New Climbers can climb free for the first visit! Climbers of all abilities are welcome. Only individuals who have passed the belaying course are eligible to belay at the Wall. OA offers free belaying classes for new climbers to give you instruction on how to properly tie-in and belay. Classes are offered during all regular Wall hours. If you want a fun group building activity for your organization or group, schedule a night at the Wall. Contact the OA Office for details. The Delaware Water Gap is a cut through the Kittatinny Mountain Range formed by years of Delaware River water flow, and is a great place to begin a hike. Mt. Tammany sits above the Gap and offers beautiful views from the ridge to the river. Take this chance to get outside and enjoy spring in one of New Jersey's most beautiful places. Saturday, 4/8, 9 a.m. - 5 p.m.
Community service is both wonderfully rewarding and incredibly challenging. Reflections on Service is an opportunity for Princeton students involved in service to share their experiences, highs, lows, and wisdom learned. Join us on Wednesday, April 5 at 7:30 PM in Murray Dodge. Sponsored by OA, SVC, and Community House. See also the Trail Maintenance Trip over "Dead Week"
In June 1998 two teams of womenone a group of breast cancer survivors, another a group of young Princeton University womenclimbed Alaska's Mt. McKinley (also know as Denali). The ongoing purpose of the Climb is to raise funds for breast cancer research, raise awareness that 1 in 8 American women will get breast cancer, and to support those with the disease who struggle against the odds. This is an inspiring one-hour PBS documentary about the climb, with a soundtrack by major artists including the Indigo Girls, Mary Chapin Carpenter, and Paula Cole. Join us as a Janine McGuire '92, an OA Leader and member of the 1999 Princeton Eco-Challenge Team, shares with us her race experiences from Patagonia, Argentina. The Eco-Challenge is an Expedition Race for teams of adventurers, each team consisting of four members, both men and women. The teams race 300 miles non-stop, 24 hours a day, to a finish line via a series of checkpoints. They utilize only non-motorized transportation such as canoes, kayaks, mountain bikes, whitewater rafts, horses, and their feet. It usually takes 6-10 unrelenting days to complete the course. Janine will show slides, describe her experiences, how she trained for the event, and show video clips of the upcoming Discovery Channel special. If you spend more than a few days at a time out on the trail, planning a menu with proper nutrition is extremely important. Learn about menu planning, dietary requirements, nutrition risks, and food safety for the serious backpacker. Dave English is a Registered Dietitian and dining manager at Stevenson 91. An avid hiker, Dave has significant experience with this topic. If you plan to spend more than a few days in the wilderness, please join us for this informative event. The Everest IMAX film astounded people with the beauty and harshness of this remote and dangerous mountain. Follow an international team of climbers as they scale the tallest Himalayan peak through skin-blistering cold, angry blizzards, and dizzying altitudes with little or no oxygen. Filmed during the infamous 1996 storm which claimed eight lives, Everest shows images of the inspiring yet deadly vistas of Mt. Everest. If you are going to be around between the end of final exams and Reunions or Graduation, then there is not much to do on campus (that's why they call it "Dead Week"). Sign up for and OA Trip and enjoy the spring! The sign-up deadline for all "Dead Week" Trips is Friday, April 28. Discover the excitement of living in the woods and hiking along beautiful ridges and beside winding streams. The sensation of carrying everything you need on your back can be incredibly satisfying, particularly when you can share the experience with a group of friends. These trips will spend 4 days traveling in the backcountry in a small group. Each trip will cover 4-8 miles each day and basic wilderness and minimal impact camping skills will be taught. Possible destinations are the Appalachian Trail of the Shenandoah Valley in Virginia, Sterling Forest of southern New York, or the ridges of the Delaware Water Gap in northern New Jersey. Equipment, transportation, and food will be provided by OA. The sign-up deadline is Friday, April 28. Participants receive a 50% refund for cancellations after April 28. Trip fee: Students $95, Faculty/Staff $120. OA's Leader Training Program is considered one of the most comprehensive in the nation and has been used as a model by numerous schools across the country. In the Leader Training Program participants develop skills in leadership, group facilitation, safety, and first aid, as well as valuable wilderness travel skills. Upon completion of the program, participants are eligible to apply to lead OA trips. The components of training are offered several times each semester. The program is structured to build upon the skills learned throughout training. The Leader Training Trip serves to tie together all of the other skills. We encourage all students, faculty, and staff to participate in the OA Leader Training Program. HEART (Health Education and Rescue Training) Wilderness First Aid is an intensive course that covers patient examination and evaluation, body systems and anatomy, wound care, splinting, environmental emergencies, and backcountry medicine. Hands-on simulations provide first-hand training in treating patients. This is an excellent course taught by experienced Wilderness First Responders and Emergency Medical Technicians and is highly recommended to all wilderness travelers. Adult CPR certification by American Red Cross Instructors is included. This class fulfills the First Aid requirement for OA Leader Training. Course fee: $89 leaders-in-training, $100 students, $120 faculty/staff. See the Spring Training Schedule for times and locations. Outdoor Simulation Class: Friday, 4/14, 1 - 4 p.m. Outdoor Simulation Class: Friday, 4/14, 1-4 p.m. Facilitating groups requires developing special sensitivities to teachable moments. The facilitator's role is to provide an experience and then to guide people through personal growth and development. This workshop will train OA leaders and others who work with groups in specific techniques for effective group facilitation. This is a hands-on, experiential workshop. Be prepared to have fun! One of the greatest challenges of being a group leader is learning how to lead and motivate a group, and how to use group experiences to promote self-exploration and learning. This workshop is designed to teach OA leaders and others how to effectively lead groups. This is a hands-on, experiential based workshop so be prepared to be active. You must have completed the Facilitators Workshop previously in order to attend. Note: Date and time have changed! This seminar is designed to make all wilderness travelers familiar with the causes of accidents in the wilderness, how to prevent accidents through effective pre-trip planning, how to identify risks in the field, and how to increase your margin of safety. We are offering two Leader Training Courses this spring. Most of the trips we offer are backpacking trips, therefore, most leaders-in-training participate in a Backpacking Leader Training Course. The Backpacking & Canoeing Leader Training Course provides training in both backpacking and canoeing, so this is a great opportunity for anyone interested in leading both types of trips. See the Spring Training Schedule for times and locations. Leading a backpacking trip requires extensive training in wilderness camping skills. The Backpacking Leader Training Course is designed to teach all the wilderness skills necessary to lead multi-day backpacking trips, including route planning, equipment preparation, wilderness travel techniques, map and compass, outdoor cooking, minimal impact camping, etc. The course includes 16 hours of pre-trip classes and preparation, and a 5-day trip. Trip participants will plan all aspects of the trip, including route, food, and equipment, and each participant is required to research and teach a class on a particular wilderness topic. Participants are required to attend all meetings and classes. The text for the course will be the Backpacker's Field Manual, written by Outdoor Action. Course fee: $95 students, $120 faculty/staff. This course will cover the same skills taught in the Backpacking Leader Training Course, plus the skills necessary to run a multi-day canoeing trip. This 7-day trip will spend 3½ days backpacking and 3½ days canoeing, so participants will gain experience in both skill areas. This is a requirement for anyone interested in leading a canoeing Frosh Trip. Course fee: students $115, faculty/staff $145. Canoe on Carnegie Lake: Friday, 5/12, 3 - 6 p.m.
OA Leaders are strongly encouraged to become authorized van drivers. You must attend a two-hour training class and complete a 15-minute road test. Additional information can be obtained by calling the Public Safety Office. Thursday, 3/23, 4:30 - 6:30 p.m.
Tuesday, 4/4, 7 - 9 p.m.
Wednesday, 4/26, 4:30 - 6:30 p.m.
Tuesday, 5/9, 7 - 9 p.m.
Monday, 5/22, 8:30 - 10:30 a.m.
OA is sponsoring a Wilderness First Responder (WFR) Course in August taught by Wilderness Medical Associates. This is an excellent course for anyone spending extended periods in wilderness or remote environments including backpackers, paddlers, climbers, photographers, and scientists. This 72-hour course is specifically designed to emphasize the wilderness contextremote locations, severe environments, and simple improvised equipment. The course will cover patient examination and evaluation, body systems and anatomy, trauma care, environmental emergencies, splints, wilderness rescue, and backcountry medicine. This is an intensive course that meets 10 hours each day with morning lectures and afternoon skills practice including simulated rescues, daily quizzes and a final exam. The course will run from 8:00 AM - 6:00 PM each day and will be held at the Princeton-Blairstown Center. The cost of the course includes lodging and all meals. Participants will be staying in rustic cabins at the Center. Preference will be given to OA Leaders and Leaders-in-training. Course fee: OA Leaders $295, Princeton students $495, faculty/staff $590, outside the University $675. The Princeton-Blairstown Center has openings for summer staff in its summer camp program. Each summer PBC offers an outdoor adventure program for urban youth ages 10 - 17 at their camp in Blairstown, NJ. This is an exciting and challenging opportunity to work in the outdoors. The positions available are Counselors and Support Staff. For more information contact the PBC Office in Princeton at 8-3340 or visit the Princeton-Blairstown Center Web site (webware.princeton.edu/PBCenter/index.htm). Persons interested in summer positions or in post-graduation careers involving the outdoors should examine three monthly publications that are kept in the OA Office. The Environmental Opportunities Newsletter, Association for Experiential Education Jobs Clearing House, and SCA Earthworks list positions available in environmental education, outdoor education, environmental lobbying, research, and teaching. For job counseling services see Rick Curtis or the Career Services Office. See the OA Guide to Outdoor & Environmental Careers on the OA Web Site.